Before you invite your members to join your community, let's set up your space. You can create a custom registration form to each group you create. To create your registration form, go to your Group Settings and click Registration Form. Make sure each one of your members is welcomed into the community in the best way - and that no one misses out on a special welcome. Membership emails are automatic emails that you can set up to be sent to the members at each step of their onboarding into the community. There are 4 emails you can set up for the different stages of the registration process and you can find those emails in your Group Settings under - membership emails. We have prepared some templates for each one of the emails that can go ahead and adapt to your community. 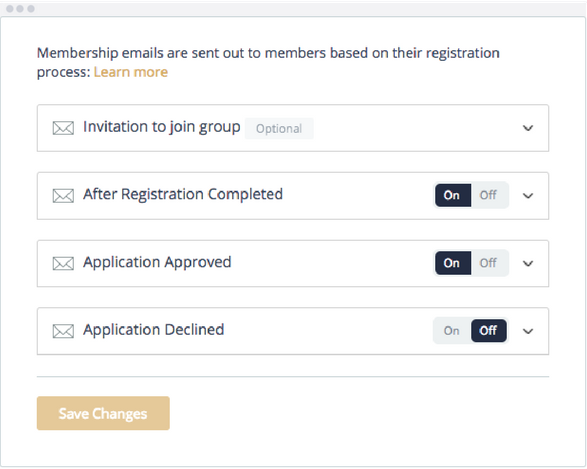 If you're adding members from a spreadsheet or a list of emails, you can send them an invitation email to introduce them to Mobilize with a big button at the bottom that takes them to register on the form and see the community. If you are using a registration form for new applicants, and you don't let new applicants in without approval, this email will be sent when your applicant finishes filling out the form to let them know they successfully applied. This is sent in 3 registration scenarios. 3a. If you have set your group privacy to Requires manager approval, then this email will be sent automatically to the members you approve into the group. 3b. If you did not set your group privacy to Requires manager approval and all applicants can join freely, those new members will get this email. 3c. If you imported a member yourself and then the member successfully fills out the form and registers with all their profile details, the member will get this email. Just in case you don't wish to approve a member into your group, this email will be sent to those you do not approve in to the group.